Dr. Jagir Singh Dhesa, Head Post Graduate Department of Punjabi in this college, is a versatile personality. During his teaching career of over 24 years he has made significant contribution to the field of Education, Literature and Social Services. To enrich the student's personality and deepen his understanding of the social environment in which he lives. To develop an awareness of his responsibility to society. To promote a concern for the well being of the community. To undertake and participate in the activities designed to tackle social problem and to promote welfare . To provide work experience which might lead students to find avenues of employment ( as a self-employed person rather then a job seeker on completion of the University Career). PMN college has a very active NSS dept. On 25 Jan. 2015, National Voters day was celebrated under the supervision of Sh. J.K. Jain (S.D.M. Rajpura) and the co-operation of the NSS department of the college. Tehsildar Joginder Pal and Naib Tehsildar Gurmeet Singh Michra also attended the function. Sh. J.K. Jain distributed identity cards to the New Votes. A declamation contest was organized on this occasion. The judges Prof. Dr. S.P. Jindal , Dr. Mandeep Singh and Prof.Cheena Chawla declared Dimpy Kalra first, Maninderjeet Kaur second and Monika third in the Declamation Contest, Amar was declared first, Neha stood Second and Manpreet bagged the third prize in the slogan writing contest. On 15 Feb. 2015, the 7 days NSS camp (Boys and Girls units) began under the supervision of NSS programme officers Prof. Dr. Jagir Singh Dhesa, Prof. Dr. Mandeep Singh and Prof. Rajwinder Kaur. Dr. Pawan Kumar, Vice-Principal of the college, inaugurated the camp. A total of 280 volunteers participated in the camp. Various activities like cleanliness of the college campus, preservation of trees, awareness against drug-addiction, awareness regarding natural disasters and lectures concerning health issues were organized during the camp. On 18 Feb. 2015, a social awareness rally against drug, female foeticide and other social evils was organized by the NSS department under the supervision of Prof. Dr. Jagir Singh, Prof. Dr. Mandeep Singh and Prof. Rajwinder kaur after it was shown the green flag by Principal Dr. Hardeep Singh Teja. On 20 Feb. 2015, a blood donation camp was organized under the supervision of NSS programme officers Prof. Dr. Jagir Singh, prof. Dr. Mandeep Singh and Prof. Rajwinder kaur. The camp was inaugurated by the principal Dr. H.S. Teja. The entire blood donation team of Govt. Rajindra Medical College and Hospital, Patiala reached the camp under the supervision of Dr. Amandeep Kaur. A total of 103 students donated blood during this blood donation camp. On 21 Feb. 2015, the 7 days NSS camp was concluded spreading the message of truth, love, service, moral values and awareness against social evils to the volunteers under the supervision of programme officers Dr. Jagir Singh, Dr. Mandeep Singh , Prof. Rajwinder kaur and Prof. Cheena Chawla. Dr. Pawan kumar Singla (Controller- Examination, Punjabi University Patiala) attended the concluding day of the NSS camp as chief guest. Addressing the volunteers, he said that the NSS department of PMN College was performing the pious and noble task of character development and that the discipline of NSS volunteers was an example in itself. Dr. Dhesa presented the camp report. Jagtar Singh (M.A. Punjabi-II) and Monika Sharma (B.Com-III) were declared the best volunteer among boys and girls respectively. On 20 Aug. 2015, Van-Mahotsav (annual tree planting festival) was celebrated in the college under the supervision of of NSS programme officers Dr. Jagir Singh Dhesa, Dr. Mandeep Singh , Prof. Vandana Gupta and Prof. Avtar Singh. Dr. Ashwani Kumar, Principal of the college, inaugurated the festival by planting a sapling. He inspired the NSS volunteers to plant as many number of saplings as possible to protect the environment from getting polluted. He said that not only planting but protecting the saplings is also important. On 8th September, 2015 under the instructions of youth welfare Deptt. (Govt of India) the NSS department of the college organized a competition ‘Leadership and Personality Development’ based on Swami Vivekanand’s book ‘Personality Development’ under the supervison of Programme officers Dr. Jagir Singh Dhesa, Dr. Mandeep Singh, Prof. Vandana Gupta & Prof. Avtar Singh. A total no. of 45 students participated in the event. Manpreet Kaur (B,com 2nd ) stood first, Geetanjali (B.A 2nd ) was declared second and Bhawna (B.com 1st ) bagged the third prize. Principal Dr. Ashwani Kumar congratulated the NSS department for inculcating positive qualities in the students by organizing such events and competitions. 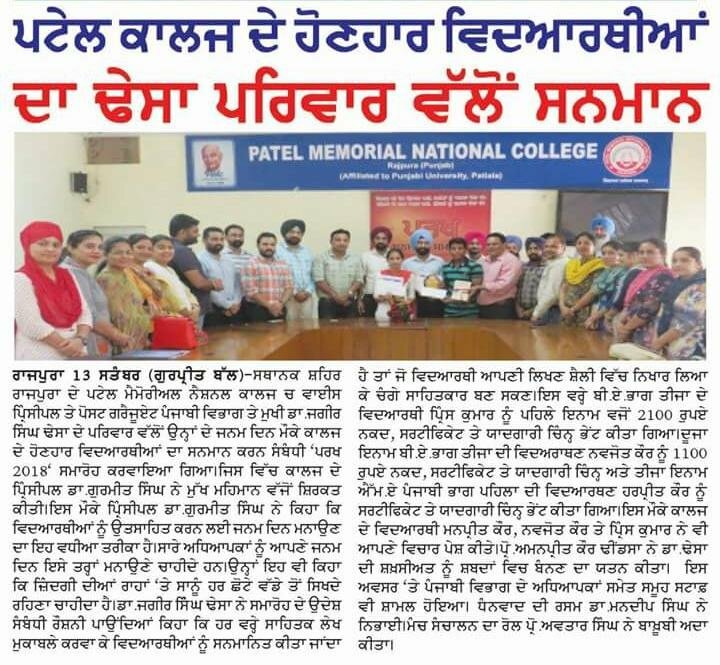 On 31st oct. 2015, NSS department organized a National Seminar on ‘The Prominent Personality: Sardar Patel’ on behalf of UGC and Punjabi University, Patiala. The Seminar is being organized to celebrate the 140th Birth Anniversary of Sardar Vallabhbhai Patel.Principal Dr. Ashwani Kumar, welcomed the guests and occasion was started with the University Dhuni. Dr. S.P. Jindal, Principal Dolphin (PG) College of Science, Chunni Kalan graced the occasion as Chief Guest and the keynote speaker. His Paid Sardar Patel a tribute and planted saplings as a mark of respect to his memory. NSS Programme officer Dr. Jagir Singh presented the outline of the seminar. Dr. Jagir Singh presented a research paper ‘Sardar Patel di Ajoke Prasang wich Sarthakta’ which was followed by a research paper presentation ‘ Sardar Patel: Vision and his Achievements by Prof. Dr. Pawan Kumar. Prof. Dr. Suresh Nayak also presented a research paper ‘Sardar Patel ke Jiwan Adarsh’. On this occasion, a declamation contest was organized based on Sardar Patel in which Gurjinder Singh, Shivpreet Kaur, Sharanpreet, Monika, Sudiksha and Navneet Kaur were declared winners. Dr. Suresh Nayak handled the stage and vote of thanks was done by Prof. Dr. Mandeep Singh. A large no. of scholars, students, teachers and NSS volunteers participated in the Seminar. On 2nd January 2016, seven - day NSS camp was started by NSS department under the guidance of Programme Officer Dr. Jagir Singh Dhesa, Dr. Mandeep Singh ,Prof. Vandna Gupta, Prof. Avtar Singh and Prof. Amanpreet Kaur Dhindsa in PMN college, Rajpura. The camp was inaugurated by the Principal Dr.Ashwani Kumar. He told them that moral values like discipline, service and cooperation are taught in the camp. All the volunteers played significant roles by serving selflessly. Camp began with Shabad Gayan. After this, programme Officer Dr. Jagir Singh Dhesa welcomed the Chief Guests Dr. Ashwani Kumar, Mrs. Gulshan verma and other guests. Dr.Dhesa told them the history of NSS . He further told them that 150 volunteers of two units participated in the camp. He also threw light on the theme of the camp i.e “ Swachha Bharat and Swastha Bharat” in which cleanliness of college campus, protection of trees, social awareness rally, social evils, Personality Development, activities regarding moral values and lectures were included. On this occassion , Prof. Cheena Chawla H.O.D (Eng Dept), presented her views by saying that this selfless service connects us with our society and country. Besides this,other faculty members Prof.Ajoy Batta, Prof.Ritu Dawra, Prof.Geetu Gudwani, Prof.Kulwinder Kaur, Prof. Akant Gupta, Prof.Ashish Gupta, Prof. Montoo Kumar presented their views. Stage was conducted by Programme Officer Prof. Avtar Singh beautifully and vote of thanks was done by Prof. Mandeep Singh. On 5th January 2016, NSS volunteers cleaned the college surroundings during the seven- day NSS camp under the guidance of Principal Dr.Ashwani Kumar of Patel Memorial National College, Rajpura. While speaking on the issue of “Swachha Bharat and Swastha Bharat”, Programme Officer Dr.Jagir Singh Dhesa told the volunteers that we should change our thinking for the success of this clean and healthy India mission.If every citizen of India understands his responsibility, then we can fulfill the dream of healthy India. Besides this, Programme officer Dr.Mandeep Singh presented his views by saying that we should have the moral values like truth , love and service in our personality. With these moral values we can become better citizens. Chief Medical Officer(Retd) Dr. Shakuntla Chhabrra E.S.I hospital , presented her views on nutrition and diet. Prof.Daljeet Singh told the volunteers about the bad effects of drugs on the youth. He said that with drug addiction, they are becoming weak not only physically but socially and economically also. The volunteers presented their views on various social evils like dowry system, female foeticide, environmental pollution, drugs etc. and also gave reasonable solutions. Decorative plants were also planted by volunteers during the camp. On 7th January 2016, a sociall awareness rally was organized by the NSS department of PMN college in village Islampur. A maximum number of NSS volunteers participated in the rally and made the people of the village aware of social evils like dowry, female foeticide, drug abuse etc. The programme officers Prof. Avtar Singh, Prof. Daljeet Singh, Prof.Akant Gupta, Prof. Geetu Gudwani, Prof. Shilpa, Prof.Gurpreet Kaur supervised the rally. Respected Mrs. Gulshan Verma ji also accompanied the teachers during the rally. On 8th January 2016, the seven day NSS cam p of P.M.N college,Rajpura came to its conclusion under the supervision of programme officers Dr.Jagir singh Dhesa, Dr.Mandeep Singh, Prof.Vandana Gupta, Prof.Avtar Singh, Prof Amanpreet kaur Dhindsa, teaching the volunteers lessons of service,love,truth,moral values and message against social evils. A total no.of close to 150 volunteers of two units participated in the camp. Manveer Singh ,a student of PGDCA was declared the best volunteer from the boys units and Shivpreet,a student of B.Com final, was declared the best volunteer from the girls unit.Bahadur Singh ,a student of MA I English was given the award for best organizer and Monika Sharma( B.Com III) was given the award for best speaker.In addition to this, 40 students were given away prizes for their sincere efforts during the NSS camp. The concluding ceremony began with Shabad Gayan. Programme officer Prof.Cheena Chawla welcomed the Chief Guest Mrs.Gulshan Verma Ji. She encouraged the students to propagate the messages learnt during the camp ,in the society. College principal Dr.Ashwani Kumar congratulated the entire NSS department and applauded the volunteers for their discipline. Programme officer Dr.Jagir Singh Dhesa presented the camp report. He told that during the camp cleanliness of the college campus, presentation of trees, social awareness rally in Islampur village, personality Development and seminars on various social evils like drug abuse, dowry system were organized. He also told that the theme of the camp was “ Swachha Bharat and Swastha Bharat” which would prove to be helpful in creating a healthy society.NSS volunteers also presented a beautiful cultural programme.Volunteers took the oath of bocoming good citizens of the country. Vote of thanks was done by Programme Officer Dr.Mandeep Singh.The stage was conducted beautifully by Prof.Avtar Singh and Prof.Daljeet Singh handled the stage beautifully and the entire staff was present on this occasion. On 13th January 2016, Lohri function was celebrated by NSS department under the guidance of Principal Dr. Ashwani Kumar in PMN college, Rajpura. The function was entitled as “ Daughters’ Lohri “. Principal Dr. Ashwani Kumar presented his views on this occasion and said that we should respect daughters as they are getting success in each field of life. On this occasion, programme officer Dr. Jagir Singh Dhesa(HOD - PBI Dept) said that daughters are not any kind of burden on their parents or society rather the proud of their parents. If they are given good education, they can contribute in the development of country undoubtedly. So we should change our thinking regarding them. Social evils like female foeticide should have to be removed from society. Besides this Prof. Montoo presented his views that girls should be given their rights. Dr. Rimpi Walia (Director- PIMT), Dr. Pawan Kumar, Programme officer Dr. mandeep Singh said that even development of country depends upon the education and rights of girls. Dr. Suresh Nayak and Prof. Ajoy Batta also presented their views on this occasion. All the staff members and a great number of students were present on this occasion.